When is fighting this ko is favourable? It is quite large as both opponents can end the fight by capturing another stone. Black has 5 points + 2 captured stones. White has 6 points + 1 captured stone. The score is 0. White has two plays elsewhere as compensation. Black has 1 point. White 9+2. The score is -10. Black has a move as the compensation. - = ko threat and response, takes ko. After Black wins the corner ko. 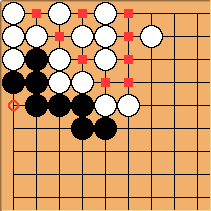 If White plays first she gains 1/3 of a point with . In a neutral threat environment when plays elsewhere gain between 1⅔ and ⅓ pt., Black can throw in with sente. - = ko threat and response, takes ko. When plays elsewhere gain ⅓ pt. or less, play can continue here. Thanks, Bill. So, the value of this position is not large. This settles it. I can now proceed to the next typical position. When is fighting this ko favourable? _Fighting_ this ko is favorable when the ambient temperature is greater than 5/3. 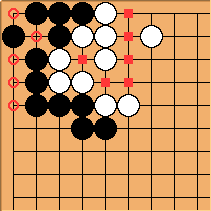 When the ambient temperature is less than 5/3, _throwing in_ for that ko is favorable in a neutral threat environment: When the temperature is less than 5/3, if Black has more threats with swing at least 6 than White has threats with swing greater than 6, then White should back down from the ko. If the ambient temperature is less than 1, then Black losing the ko results in Black keeping sente. Thus, once the temperature drops below 1, the necessary size of Black's ko threats stops decreasing, although the necessary size of White's ko threats will continue will to increase as the temperature decreases to 0. 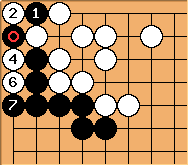 Accordingly, Black should probably hope to time for when Black has enough threats with swing greater than 5+(1/3) and the ambient temperature is between 1/3 and 1. 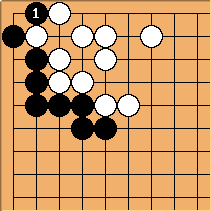 If Black manages to do that, then White should back down with , which lowers this corner's temperature to 1/3. 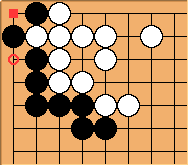 Note that White doing so results in Black keeping sente. After White backs down in that way, would be a 1/3-point ambiguous play and - would be sente for White. except that if the ambient temperature is 0 and Black would win the "White backs down" diagram for free, then White is indifferent between backing down and ignoring a Black ko threat whose swing is exactly 6. However, replacing "the temperature is less than 5/3" , "at least 6" , "greater than 6" with "the temperature is at most 3/2" , "greater than 6" , "at least 6+(1/6)" respectively would yield a true statement, so in particular this exception does not affect the part before the colon.